Happy Wheels Updates: Good news! So, THE NEW CHARACTER IS HERE. 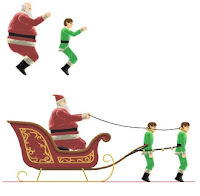 The character is called "Santa Claus" and doesn't have wheels, of which has never been done before. Santa's sleigh is powered by elves. The sleigh is also filled with presents. The best feature though, is the fact that Santa can FLY when space is pressed. Their is a limit to your flying abilities, it has a meter similar to moped couple's. Santa is AWESOME. Click the picture to make it larger.